Do you ever feel guilty eating dessert? I certainly do, and my sweet tooth still gets the best of me from time to time. Ditch the guilt and indulge yourself with this treat of a smoothie that’s healthy and nutritious. The star ingredient of this smoothie is obviously carrot, which imparts these wonderful health benefits. Carrots combined with all the other ingredients in this smoothie make it one healthy dude. The original recipe called for 1/2 banana. I substituted avocado because I was fresh out of bananas and am partial to avocado. If you use banana you might want to add a few ice cubes to thicken and a little less honey if you don’t like overly sweet smoothies. My Blendtec pulverized the chopped carrot pretty well. There were a few small pieces to chew, which I actually liked. Enjoy! 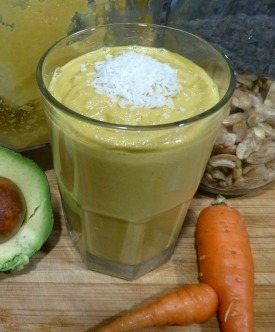 Niko and I would love to know if you try this carrot cake smoothie – please leave a comment below. Happy Blending! I think you’ll like it, Niko. The key ingredient are the cashews IMO. I really want to try this smoothie! However, I’m a little confused about the “add-ons” – are they optional or required? All of the add-ons are optional ingredients. Hope you enjoy this smoothie. Tried it, it tasted really good. Delicious and filling. I switched the cashew for almonds because that’s what I got at home and always snacks on. What else could be substituted for the nuts in this recipie? I am vegetarian and all nuts cause some skin issues. Thanks! I would simply omit the cashews, Melinda. What the heck is a “cup of carrots”? The carrots I buy are not shaped in such a way as to be measured in “cups”. Can you give a weight measurement, please. Shredded or chopped carrots can be roughly measured to a cup. If you’re using whole carrots just wing it. Doesn’t need to be precise. just so you know, the honey in this recipe would make it not vegan..
Good point, Shante. I removed the vegan designation. Hi,your carrot cake smoothie looks really good and tastey but the carbs and sugar is a little bit high and yet it is healthy.do you think your carrot cake smoothie will be ok for me to make it in my magic bullet blender?I have shredded carrots in a bag but I have to go buy the rest of the ingredients at one of our several grocery stores and then I can make your smoothie. I will let you know how much my mom and I enjoy your carrot cake smoothie soon. How can i make your smoothie to have less carbs and sugar in this smoothie? If you omit the honey the sugar and carbs will drop quite a bit, Kim. Try that and enjoy with your mom!